The leader in veterinary diagnostics continued to report strong growth last year. Shares of Idexx Laboratories (NASDAQ:IDXX) climbed 18.95% last year, according to data provided by S&P Global Market Intelligence. The stock was up about 60% through September, but the turmoil in the markets in the last three months of the year took away most of that return. Despite the dip, the leader in veterinary services still looks like a good investment. Check out the latest Idexx Laboratories earnings call transcript. 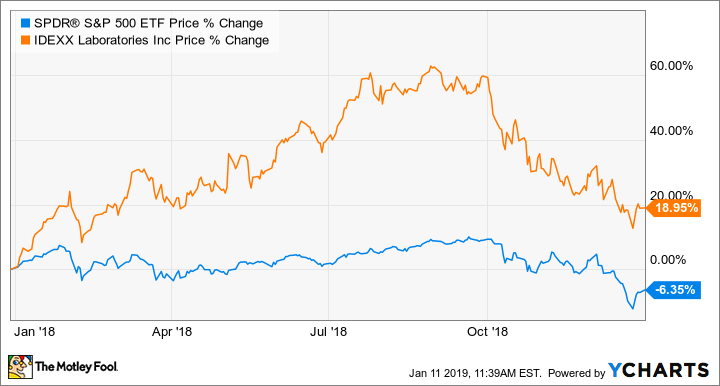 Last year was another typical one for Idexx, which posted double-digit growth on both the top and bottom lines through the first three quarters of the year. The company entered 2018 having grown organic revenue and earnings per share 10% and 20% year over year, respectively, in 2017, and the numbers got even better in 2018. Idexx grew organic revenue 12% year over year to $1.663 billion through the first three quarters of 2018. Earnings per share soared 31% year over year. The momentum was so strong that management kept raising the full-year outlook through the second quarter. However, that changed in the third quarter, when management slightly lowered expectations for full-year organic revenue to grow by 11.5% to 12% year over year. The updated outlook was somewhat lower than the 12.5% organic revenue growth management had previously called for at the high end of the range. That seems like a silly reason to punish the stock, but when there is pessimism hovering over the broader market, any sign of slowing momentum can cause short-term-focused investors to hit the sell button -- especially for stocks like Idexx that trade for high price-to-earnings ratios. Idexx continues to benefit from more people, especially millennials, spending more on pet care, and pet owners will spend on their furry babies no matter what the economy is doing. This is one reason why Idexx shares typically trade for a high valuation. Early 2019 guidance calls for continued growth in the new year, with organic revenue expected to grow 9.5% to 11% over 2018. That should translate to earnings-per-share growth of 15% to 18% (adjusted for changes in foreign currency conversion rates). Investors probably balked at management's revenue guidance, which is lower than previous figures. However, the long-term trend of increased spending on pet care is in the company's favor, which should keep Idexx growing for many years.